When it comes to opulent New Year&apos;s Eve dining in style, you can&apos;t beat Everest. This enduring Chicago legend is just as pristine and impeccable as it&apos;s ever been, and when coupled with the stellar views from the 40th floor of the Chicago Stock Exchange, you&apos;ve got a New Year&apos;s meal to remember. The French-accented restaurant is serving a couple menu options for the holiday: there&apos;s a prix fixe for $120 or a tasting menu for $185. There&apos;s also a vegetarian option for $135. Swing by The James Hotel for a couple New Year&apos;s options at Primehouse Bar and JIMMY. Both spots are keeping it upbeat and casual for the occasion. The former starts the party at 9:00 p.m. with a live jazz quartet and a one-night-only menu of specialty cocktails made with Henriot Champagne. Plus, a complimentary Champagne toast will be served at midnight. At JIMMY cocktail lounge, things are a little livelier, with DJ Justin Nolan in attendance. Eclectic cocktail specials will be on hand, along with a complimentary midnight Champagne toast. Dine family-style at Ruxbin this year, as chef Edward Lee serves up a six-course feast "for the table." With seating options between 6:00 p.m. and 10:30 p.m., the menu includes smoked oysters, Kurubuto squash and Nebrodini mushroom, Nigerian prawns, black cod, prime rib, and dessert options of chocolate with marshmallow fluff and pomegranate or persimmon with coconut milk, brioche, and sesame. Either way, a flavorful and memorable way to cap off 2015. Keep things casual and tropical with a New Year&apos;s shindig at Lost Lake. The tiki bar is celebrating from 9:00 p.m. until 2:00 a.m., during which time guests can enjoy an open bar, food from adjoining Chinese restaurant Thank You, and dance in the "Cave." General admission tickets can be purchased here, and table reservations can be made by emailing mia@lostlaketiki.com. To celebrate its inaugural year in business, Wilmette&apos;s darling new dining gem, Firefly Kitchen, is bringing a taste of Brooklyn to the north shore. The "Brooklyn-style" New Year&apos;s Eve party is designed to host 125 guests, starting at 7:30 p.m. and running until 1:30 a.m. During this time, guests can feast at the fresh raw bar and other food stations serving up beef tenderloin and Italian fare. Meanwhile, passed heavy appetizers will include the likes of crab cakes and other delicacies. Wine, beer, and cocktails will be available for purchase, while music and a television monitor of Times Square keeps things entertaining and lively. Tickets are available here, by calling the restaurant, or by emailing info@FFKitchen.com. Pricing is $65 per person or $70 at the door. When three or six courses just won&apos;t cut it, head to Cherry Circle Room for a decadent spree of nine courses on New Year&apos;s Eve. Served from 6:00 p.m. until 1:00 a.m., the restaurant inside the storied Chicago Athletic Association hotel is going big for the holiday with items like scallop crudo, oysters, roasted duck, rib-eye, and lots more. Feel free to up the ante and gild the lily with meal supplements like Siberian Osetra caviar and white Alba truffles. Wine pairings are also available. Tickets are $125 per person for seatings between 6:00 p.m. and 7:00 p.m., or $150 for seatings between 9:00 p.m. and 10:00 p.m., which includes a Champagne toast. Reservations can be made here. Another fabulous New Year&apos;s option at the Chicago Athletic Association is Cindy&apos;s, the crown jewel of the hotel situated on the property&apos;s rooftop. What makes this option so appealing is that the rooftop bar and restaurant is eschewing the traditional New Year&apos;s shenanigans for festive drink specials curated by Nandini Khaund and food specials by Christian Ragano. It&apos;s a casual alternative to the norm, without sacrificing any of the pristine quality. The restaurant is open on December 31 fro 3:00 p.m. until 2:00 a.m. Call 312-792-3502 to make reservations or email cindysinfo@chicagoathletichotel.com. 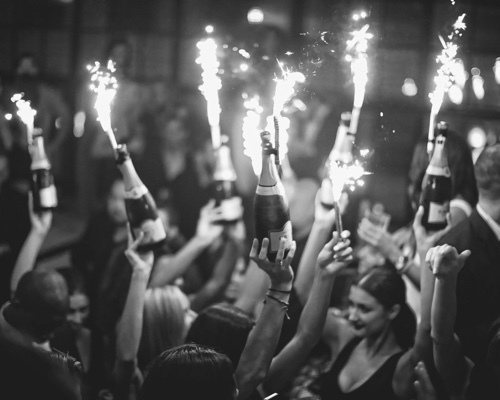 If it&apos;s the classic New Year&apos;s Eve party you crave, with dancing and bubbly aplenty, head to Studio Paris. Lil&apos; Jon will serve as DJ for the evening at River North&apos;s quintessential club, which is celebrating NYE from 9:00 p.m. until 2:00 a.m. Passed hors d&apos;oeuvres will be on hand, and premium bar packages are available. Head underground to ring in the new year in style at Izakaya at Momotaro. The subterranean Japanese haunt will be doling out passed hors d&apos;oeuvres starting at 9:00 p.m., and guests can participate in four-hour premium bar packages that include wine, beer, sake, Champagne, and cocktails. Tickets are $90 per person, or opt for a table (seats up to six), which includes express entry, a bottle of Veuve, and table side hors d&apos;oeuvres. Tickets are available here. Head to Eastern Europe by way of River North at Bohemian House, where New Year&apos;s Eve diners can partake in a few specials off chef Jimmy Papadopoulos&apos; "Cellar Menu." For the holiday, he&apos;s serving up dishes like foie gras sausage with rutabaga, brandied apples, prunes, and chestnuts; lobster egg noodles with mushrooms, carrots, pistachios, creme fraiche, and black truffles; and roasted duck for two with glazed breast, leg goulash, smoked sausage, sauerkraut, lingonberry, and bread dumplings. All diners also get a gratis Champagne toast at midnight. In Ravenswood, one of the hottest and most comfortable new neighborhood dining spots of the year is keeping things comfortable with a frills-free three-course prix fixe, inclusive of wine pairings. The spread at Ampersand includes Burrata and arugula salad with prosciutto di Parma or sweet potato soup with green cardamom creme fraiche and spiced pepitas; followed by roasted heirloom carrots with wild mushroom puree and umami powder or curried cauliflower with duck confit. The third course options are ocean trout with pureed sunchoke and toasted hazelnuts or braised oxtail with kale and salsa verde. The cost for the menu is $85 per person. A trip to Spain is certainly a lavish way to cap off the year. You can do so (without even having to grapple with the airport) by dining at Salero for New Year&apos;s! The West Loop stalwart is hosting a Fiesta de España filled with Spanish flavors over a four-course meal. Reservations are available starting at 5:00 p.m. and extend all the way until midnight. Diners have an option for each course, and menu highlights include wood-grilled prawns with sherry butter and piperade; grilled Maine lobster with clams, fideos, peppers, and aioli; grilled strip loin with sauces mojo rojo and mojo verde; and chocolate cremeux with persimmon and turron. Wine pairings are available as well.